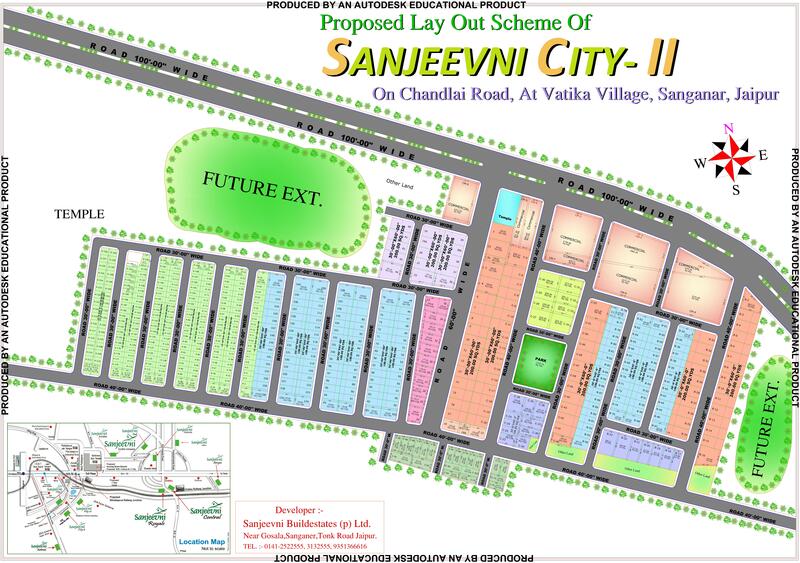 Sanjeevni City III is located at NH-12, Tonk Road Jaipur, in South Jaipur. South Jaipur is developing at a scorching space with multiple mega projects, satellite towns, the biggest Ring Road and other infrastructure projects of repute. All these developmental works are bound to make this part of the Pink City the preferred business as well as residential destination, as being the case of the south of Delhi. Sanjeevni City is an integrated township spread in consisting of around 600 residential plots of sizes admeasuring 50 sq. yards to 600 yards, on NH 12 (Tonk Road). It is strategically having a 6 minutes drive from the Chokhi Dhani . As evident from most cities in India, south Jaipur is slowly and steadily becoming the preferred commercial destination with most of the mega projects of the city being undertaken in this direction, Sanjeevni City, World Trade Park, Gold Souk, Fortis Hospital, EPIP Zone, Sitapur Industrial and Institutional area, existing domestic as well as proposed international airport to name a few.